Please see our Health Effects of Low Frequency Noise (Vibroacoustic Disease) page for more in-depth information. Here is a report presented to the Maine Medical Association in March, 2009, on a study of wind turbine effects in Maine. Click the image to download the PDF file (2-Mb) of the full presentation. As a part of the widespread enthusiasm for renewable energy, state and local governments are promoting what appear to be lenient rules for how industrial wind farms can be located in communities, which are predominantly rural and often very quiet. Complaints from residents near existing wind turbine installations are common, however, raising questions about whether current U.S. siting guidelines are sufficiently protective for people living close to the wind turbine developments. Research is emerging from studies of commercial windfarms in Europe, that suggests significant health effects are associated with living too close to modern industrial wind turbines. Research into the computer modeling and other methods used to determine the layout of wind turbine developments, including the distance from nearby residences, is at the same time showing that the output of the models may not be accurate enough to be used as the sole basis for siting decisions. G.P.Van den Berg, a Dutch physicist discovered that the methods used by wind turbine developers, in the UK and elsewhere to predict noise are seriously flawed because of their assumption that wind speeds measured at a height of 10 metres are representative of wind speed at the greater heights of modern turbines. His measurements show the wind speeds, especially at night, are up to 2.6 times higher than expected. Rather than heeding the results of the European experience (which is far greater than the US) windfarm developers in the US have actually pushed for more lenient standards. There are two major problems with current San Miguel County standards for siting commercial wind turbines. The first is the absence of a maximum decibel level based on some volume above the base (quietest nighttime) level, and the second is the absence of any requirement that the noise levels be determined with a C-weighted sound meter. By using only A-weighted meters the Industry is unable to measure low frequency sound, the component that is responsible for most of the adverse health effects. If regulations could establish "real" guidelines (i.e. maximum sound levels of the L90 + 5dB and a maximum of 15dB difference between the A-weighted and C-weighted measurements) would ensure the safety of the citizens of our community. MANCHESTER - Wind farm developers and health experts participated in a forum before the Maine Medical Association Public Health Committee on Wednesday to discuss research on wind turbine-related health problems at MMA's headquarters in Manchester. Weighing in were Dr. Albert Aniel, an internist at Rumford Community Hospital, Dr. Michael Nissenbaum, a radiologist at Northern Maine Medical Center, former Gov. Angus King, a partner in Independence Wind and Dr. Dora Ann Mills, director of the Maine Centers for Disease Control and Prevention and the state's chief medical officer. Aniel and Nissenbaum would like the state to place a moratorium on future wind projects until more research on the effects of turbines on people can be gathered and analyzed. Aniel sent a letter to that effect to the governor's office about a month ago. 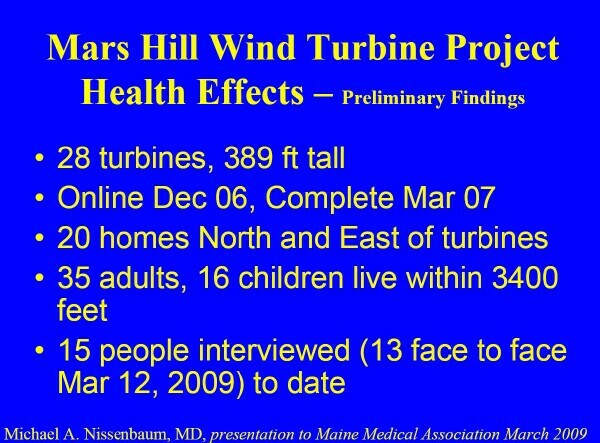 Nissenbaum presented interviews he conducted with 15 people living near the wind farm in Mars Hill, citing examples of sleep disturbances, headaches, dizziness, hypertension, weight changes and increased prescriptions. "The noise is made by the blade tip swinging by the tower at speeds of up to 170 mph," he said. "If turbines sync, the noise will be louder. The noise occurs just a little faster than a human heartbeat. People find this extremely annoying." Stress was the most common symptom Nissenbaum encountered in his research. He said many of the physical reactions, such as sleep disturbance and headaches, could be related to stress caused by the sound of the turbines. King said he has visited the Mars Hill farm and has "no doubt" that there are legitimate issues. "I spoke to one resident, Wendy Todd," he said. "It's apparent that it's bothering her and her family. But this discussion we are having today is in reference to a statewide moratorium for all wind projects. It would be poor science to base that decision upon a group of people in Mars Hill without looking at what the differences between the projects are." King, whose company is developing a wind farm in Roxbury, said the nearest homes to his proposed project would be three times farther away from turbines than the nearest homes to the project in Mars Hill. "If we all agree a wind turbine in Chicago will not bother anyone in Augusta, then all we are talking about is what's the appropriate distance," he said. With proper planning, concerns about "shadow flicker," the effect of the blades spinning through sunlight and casting flickering shadows, and sound pollution - audible and low-frequency - can be avoided, King said. "We have a setback law, but it's expressed in decibel terms," he said. "The Maine standards for quiet, rural areas is 45 decibels, 35 inside the house, very similar to what's suggested by the World Health Organization." The Mars Hill project does not fall under Maine rules because the state granted an exception, Mills said. She said she became aware of health concerns around turbines when she got a call from Aniel. After conducting extensive online research, Mills said she agreed with King, that distance is the key to preventing problems. "Research showed if you live really close and have high exposure to noise, to either high or low frequency, you will have high annoyance issues and lack of sleeping because of that," she said. Mills said she opposes a statewide moratorium. "We know Maine people die now from diseases caused by burning fuel," she said, adding that Maine has the highest cancer rate in the country and the highest rate of childhood asthma. "We need to figure out the proper distance for turbines, but I don't think this is an epidemic." The committee will meet again on May 20 and is expected to make a recommendation to the full association on whether to support a wind farm moratorium. No legislation has been filed to impose such a moratorium, and Gov. 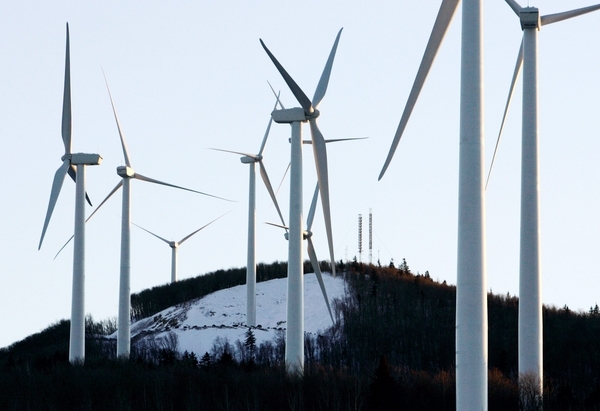 John Baldacci remains a strong proponent of developing wind projects in the state. Download a pdf file of this story here (36kb). The following sections briefly describe a process for assessing the impacts of existing or proposed actions on the acoustic resources and soundscapes, and other resources that may be termed “sound-sensitive.” The premise for analysis is that an action having acoustic properties will directly impact the park soundscape and acoustical environment. Sound-sensitive resources or values may include biological resources, special areas such as wilderness, cultural and historic resources, and visitor experience. 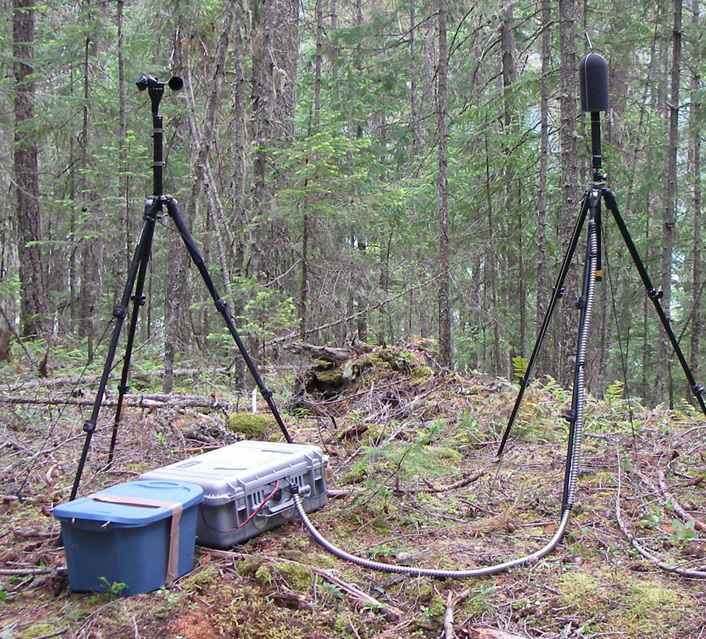 The NPS Natural Sounds Program begins acoustic analysis by indentifying sound sources and their characteristics that may affect the sound environment. For most sound sources, such characteristics would include the location and movement of the source, its operational features that produce sound and how the sound would be distributed over time. The sound sources themselves are defined or measured using various noise metrics. The NPS measures decibels across the frequency spectrum, divided into third-octave bands. NPS also collects audibility logging data and short sound recordings to assist in the identification of the sound sources. Such measurements allow us to calculate a variety of metrics including maximum decibels of an event, numbers of events, noise free intervals, audibility, time of audibility and the area where the sound is audible. These metrics are compared to soundscape objectives developed for each management zones. Different zones are likely to have different objectives for soundscape management. A wilderness zone should be composed mostly of sounds reflecting a natural setting, whereas a developed zone is likely to have a large component of human and human related sounds. Functioning ecosystems depend on natural acoustical environments. Many animals, insects, and birds decipher sounds to find desirable habitat and mates, avoid predators and protect young, establish territories, and to meet other survival needs. Scientific studies have shown that wildlife can be adversely affected by sounds and sound characteristics that intrude on their habitats. Although the severity of the impacts varies depending on the species being studied and other conditions, research has found that wildlife can suffer adverse physiological and behavioral changes from intrusive sounds and other human disturbances. Some sound characteristics have been associated with suppression of the immune system and increased levels of stress-related hormones in animals. Studies have also shown that songbirds that live in places with increasing sound levels have to sing louder than birds in quieter environments, and not all species have the ability to adapt in this way. Birds forced to sing at a higher volume have to expend increased levels of precious energy to attract a mate or warn of predators. 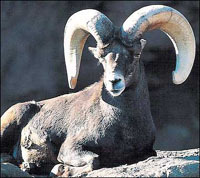 Bighorn sheep are less efficient at foraging for food when they are exposed to aircraft, and mountain goats often flee from the sound of helicopters and airplanes. Still other research has demonstrated that intrusive sound properties can adversely affect reproductive success in caribou and communication in whales. When these effects are combined with the other stressors faced by wildlife such as winter weather, disease, insect harassment, and food shortages, sound impacts can have important implications for the health and vitality of wildlife populations within a park. The primary mission for many national parks is to protect the resources and values related to the culture, ethnic heritage, and history of a group or a place. Many locations in national parks are significant because of the meaning, memories, and experiences that people associate with them. Cultural resources include tangible materials such as structures and artifacts, as well as intangible aspects of cultural expression: oral traditions, music, and community rituals. Visitors to cultural and historic units of t he National Park System want to better understand and embrace America's heritage in a direct and personally meaningful way. An appropriate acoustical environment is an important element in how we experience the cultural and historic resources in the national parks. Visitors want to immerse themselves in the historic time period or cultural expressions associated with a site. The quiet of a civil war battlefield can evoke reflection and feelings of reverence; silence and the sound of gulls heard from a jail cell on Alcatraz Island can elicit feelings of empathy, despair or isolation. Unwanted or inappropriate sounds, such as aircraft, watercraft, vehicles, construction equipment, and energy development can detract from the overall enjoyment of their experience. The National Park Service manages park units to protect those cultural and historic sounds they consider fundamental to the purposes and values for which the parks were established. Visitors also appreciate natural sounds. Many natural sounds such as gurgling streams, bird songs, or the rustling of leaves on a fall day can have a calming and relaxing effect. Other sounds such as the chirp of crickets or a gentle breeze through a forest can trigger memories of pleasant past experiences. Visitors to national parks often indicate that an important reason for visiting the parks is to enjoy the relative quiet that parks can offer. In a 1998 survey of the American public, 72% of people identified opportunities to experience natural quiet and the sounds of nature as an important reason for having national parks. In studies of visitor preferences, respondents consistently rate many natural sounds such as birds, animals, wind, and water as very pleasing. As a result, the presence of unwanted, uncharacteristic, or inappropriate sounds can interfere with or alter the soundscape resource and degrade the visitors’ experience. Uncharacteristic sounds or sound levels affect visitors’ perceptions of solitude and tranquility and can generate high levels of annoyance. In a 2005 & 2006 study at Muir Woods National Monument visitors showed annoyance with many noise sources including aircraft, cell phones, vehicles, and park operations. Visitor evaluations of annoyance are affected by many factors including the setting in which the sounds occur, the visitors’ recreational activities, and their expectations of quiet and solitude. Characteristics of the sound also contribute to levels of annoyance. Annoyance is related to rate of occurrence, duration, and sporadic nature of sounds. Loudness is also a factor, however research on specific causes of noise such as snowmobiles and helicopters indicate that even low levels of sound that remain audible can compromise a visitor’s enjoyment of a natural setting and generate feelings of annoyance. Abstract: Since 1996, when Tararua Wind Power Limited commenced the construction of 48 wind turbines, the number of existing wind turbines on the Ruahine and Tararua ranges has risen dramatically, to 158 in 2006, with more to come from unimplemented, approved resource consents. The companies behind the applications have won plaudits for the development of sustainable energy generation. However, the effects of wind energy can be controversial. In particular, it is reported in other countries that those who live near the wind turbines may suffer from undesirable visual and noise effects, and the national benefits and local costs may not be in balance. Assessing the precise impact of future wind farm development is important, since the number of proposed wind farms is likely to grow in the coming years. The objective of this study was to investigate the noise and visual effects on local residents from the existing wind turbines in the Manawatu and Tararua region. A total of 1100 urban and rural residents, the majority living within a 3km radius of the wind farms in the Tararua and Manawatu districts were administered a self-reporting survey. The survey asked residents to assess the visual and noise effects of the closest wind farm. This paper presents preliminary results from this study. 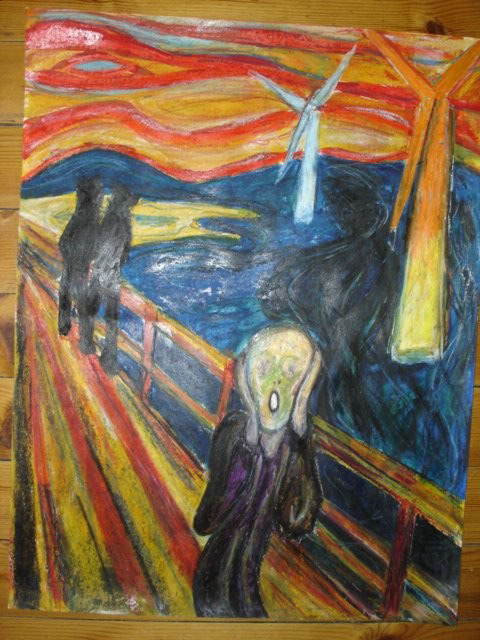 It demonstrates that 45 percent of respondents living within 2km heard noise from the turbines, and 80 percent thought that the turbines were visually intrusive. Our family lives on County Road Y in Brownsville, Wisconsin, which is about 3⁄4 of mile east of South Byron. Turbine #4 is 1560 feet behind my house. Turbine #3a is about 500 feet mostly east and a little north of turbine #4. Turbine #6 is about 3⁄4 of mile to the northwest of our home. Across the road, mostly south and slightly west is turbine #73 at a distance of 2480 feet. Down the hill to the west is turbine #74a which is about 3⁄4 of a mile away. We can hear all five of these turbines at various times. Turbine #4 turning slow for the first time. 10:00 pm I went out to check the fire and I looked up in the sky to try and see the jet flying over. It was not a jet, but the turbine. Turbine sound. Our 13 year old son, complained of a headache. He had not been told headaches being one of the side effects of turbine noise. My wife and I were concerned about how the turbine noise would affect him. He has become our son via social services with many problems. His ears are like that of Radar on MASH. He hears sounds before we do, such as fire department sirens. Saturday AM. Loudest so far. Like jet in sky with whoosh to it. I have not written every day. That does not mean the turbine sound is not there. I feel we may never have peace and quiet ever again. We can only hope there are days with no breeze. View or download the first 3 months of the diary (Mar-May08), or download the full diary (Mar08-Jan09). I don't know of any way to simulate the sounds of the turbines. What the company will do (I imagine; certainly they should be required to) is sound modeling, where they (using calculations on paper only) will predict the ways that sound should propagate in the conditions present there. They should take into account topography, vegetation, and prevailing wind directions. The van den Berg study I cite recommends that models should also predict what will happen in those night-time stable atmosphere conditions that seem to be a real problem for neighbors up to a mile or so away. You could hire, or encourage the county or state to hire (or the state to give the county money to hire? ), some acousticians to do their own assessment of likely propagation, instead of only relying on the company for that. I am not a physician/acoustician (more an editor/writer, actually), but there are some who've become widely used for these purposes. I have no idea what it'd cost. I wrote to the VAD researcher to see what her latest is on turbines--when we were in touch several years back her work had focused on people working in industrial facilities, and she'd just started thinking about turbines.....but again, the industrial facilities work zeroed in on a very few people who reacted very badly to the vibrations, while most of their co-workers were (relatively) fine. I'll let you know when/if I hear back from her. Do keep me in the loop, and let me know what I can do to help. Please visit The Acoustic Ecology Institute's News Page. Some of the content on this page may fall under the provisions of our Fair Use Notice & Disclaimer. This site is updated frequently. Please check back often to see what is new. Thank you.